So you’ve tried it all…exercise, diets, and even diet pills, and it just hasn’t worked out. Unfortunately, some people have pockets of fat that just won’t melt away. In this case, you could receive an invasive surgical procedure that would require weeks of downtime, or you could receive nonsurgical laser lipo body contouring, through MedShape Weight Loss Clinics. If you’d like to remove stubborn areas of fat from your body but don’t want to undergo surgery, LipoRx may be right for you! LipoRx is a non-surgical liposuction alternative that uses low-level lasers to break down unwanted body fat in targeted areas. LipoRx will stimulates your body’s natural fat burning processes, encouraging stored fat to be released and used as energy. ​These groundbreaking procedures actually help remove those stubborn fat cells to the point of elimination. It does this while leaving healthy tissue intact, meaning you experience no downtime, no recovery time, and no discomfort. This new Laser-Like LipoRx technology gives you hope. Have you felt frustrated you haven’t lost those 7-23 inches doing diet and exercise? 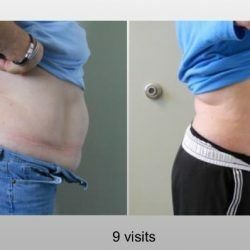 In this treatment, when you see the fat come off quickly, you will have hope and be more inspired to make the changes you know you should be doing. Not to mention the health benefits of losing weight. Laser Like Lipo body sculpting is the latest technological breakthrough in fat reduction. You can lose those unwanted inches without surgery providing you an effective solution for stubborn, localized fat areas with no pain and minimal downtime. Using state-of-the-art Laser Like Lipo wavelength technology, this revolutionary treatment gently “melts” fat to help eliminate it from your body! After treatment, the unwanted fat is naturally removed from the body through your digestive and lymphatic systems. You can treat fat on almost any area of your body with Laser Like Lipo body sculpting, but commonly treated areas are: the thighs, upper arms, love handles, chin, neck, buttocks, back and stomach. Treatment times will vary depending on what are you are treating and the severity of the area. During your consultation your MedShape Laser Technician will discuss a body sculpting plan that is right for you and review any questions you may have. Full treatment is usually completed in 4 – 12 visits, but you can see some improvement with just one treatment! The best part? LipoRx treatments are non-invasive and pain-free! For the best results, we recommend two treatments per week. How does Non Surgical Laser-Like Lipo work? Excess energy ends up stored in the body in the form of fat cells. Fat can be notoriously difficult to lose, even with extensive diet and exercise. This is because the body tends to target fat last when drawing on stored energy reserves, favoring more readily available forms of energy like sugars and carbohydrates instead. The laser lipo technology of the LipoRx is able to bypass this, however: using low-level laser technology approved for fat reduction by the FDA, it activates a natural response in the body that breaks down fat cells into a form that is readily available for energy consumption (liquifies the fat cell), effectively tricking the body into targeting fat. This allows for a non-destructive approach to circumference and fat reduction that doesn’t require surgery and leaves the body undamaged. The LipoRx machine also lets you target specific areas of the body. It’s just a simple matter of properly positioning the treatment pads. Treatments typically last about 15 minutes a session, and results can be seen even after the first treatment. You can expect 15 minutes to relax, read or do absolutely nothing. The laser treatments are completely painless. There is no heat or sensation whatsoever while being treated. Each treatment you will be met by your Counselor who will position the laser at the desired areas of the body fat you want to shrink. After positioning the laser she will step out for 15 minutes. After you are done you can get back to your normal activities immediately with absolutely no downtime, nor pain, swelling or any discomfort. This is a symptom free process except for losing unwanted inches! It is not recommended that you miss an appointment. If more than 3 days between appointments, there is a small chance some of the fat may be reabsorbed by the fat cells. We are committed to your success. If you do not call or ‘no show’ that treatment is forfeited! Liposuction is an invasive procedure that removes the entire area of fat cells from deposits beneath the skin using a hollow stainless steel tube (called a cannula) with the assistance of a powerful vacuum. Liposuction can be accomplished either with the use of general anesthesia, with I.V. sedation, or totally by local anesthesia. In contrast, these laser-like lipo treatments are 100% non-invasive through the use of a low level LED laser-like lipo frequency. These are applied externally to stimulate the fat cell and emulsify and release fat. There is no use of anesthesia, nor any pain, gels, creams, numbing agents, needles and no downtime! As with liposuction, results are not guaranteed. If recommended proper diet is not followed you will not sustain the inches you lose. Absolutely ZERO downtime. During the treatment you will feel no discomfort. No anesthesia will be used and you can assume normal activities immediately following each treatment. The treatments can be used effectively on the parts of the body where localized fat deposits exist that are resistant to diet and exercise. These areas include the belly, love handles, lower back, inner and outer thighs, arms (bat wings), chin, face jowls. Each are and and treatment are in length of 15 minutes. Yes, there are no known risks involved in using the low-level laser therapy and it is considered a safe alternative to invasive procedures such as tumescent liposuction, lipo-dissolve, and other non-invasive devices like the Accent, Vela Shape, and Thermage, which rely on heating the tissue and can cause discomfort. None of these have the proven data showing how fat cell size is reduced like the laser. The treatments are 100% non-invasive and cause no bruising, scarring, and zero downtime. During the treatment you will feel no discomfort, no anesthesia will be used, and you can resume normal activities immediately following each treatment. No. The treatment process is completely non-invasive and there are absolutely no side effects beyond loss of inches and fat! The exception to this is if you do not hydrate properly, you will feel “sick”. How long has this technology been used? Low Level Laser technology has been used to safely assist with tumescent liposuction since 2001 and was established as a proven method to release fat cells immediately prior to liposuction surgery. Low level lasers have been in use for over 40 years for treatment of many different conditions, such as chronic pain, wound healing, and many other orthopedic conditions. Yes, with treatments and by following the recommended guidelines for success, you can expect to experience a combined loss of 3-9 inches from your waist, hips and thighs, and a reduction in clothes size! Additionally, patients notice improvement in the appearance of cellulite and stretch marks. Yes, with additional treatments you can expect to see improved results. You can start in additional series of laser treatments immediately following your last treatment. How long does it take to being seeing results? Most of our patients can see results after just one treatment. We highly recommend that each of your areas treated has two treatments per week until your desired results are achieved. Many actually see significant difference after 2-3 sessions. Is everyone a good candidate for the treatment? Most are good candidates. Even people who are not overweight can lose inches. If you grab your fat and you cannot “squeeze” it, you are not a candidate. Fat must be “soft”. Your Counselor will tell you if you are not sure.